Whew, what a busy Sunday. First and thank goodness, the Seahawks looked more like their usual football selves and won, shutting out the Bears 26-0. That was some good news for this football-crazed city. Had the Seahawks lost, I think we would be in shut-down mode. People would be forced to move, property values would plummet, and Starbucks would close. It was that serious. On the downside of sports, Celeste’s soccer team lost 3-0. But on the positive side, she played well over 45 minutes when she expected to play only 5. Why? Two of the girls on her team got hurt and there were not enough subs. Celeste got thrown in to the action at left defender. She did great, despite the loss, and I think she feels pretty good about it. Next up, it was Dwight’s birthday party tonight. 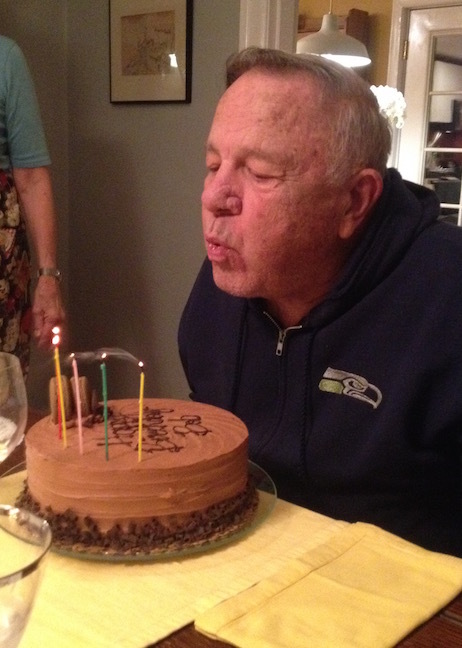 He turned 81 on Friday and tonight the family got together at Melinda’s childhood home for a little party. That’s a pretty good picture of Dwight up there on the left blowing out his birthday candles. The cake was a gift from the History Channel, go figure. Representatives were in town doing some research for a program about the infamous hijacker D.B. Cooper. Dwight has some theories that the producers were interested in hearing. After dinner, Perrin drew what she is calling “fusion” pictures. There was one for Melinda, and others for Chloe, Ella, and even one for me. 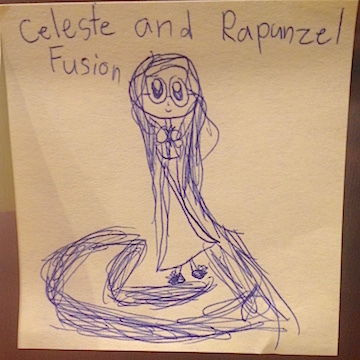 But this one on the right, fusing Celeste and Rapunzel, is pretty slick. Note the hair, obviously. All of this, and I didn’t even mention the eclipse that a rare clear night in Seattle allowed us to witness! « 26 September 2015 : I’m Training to be The Flash!